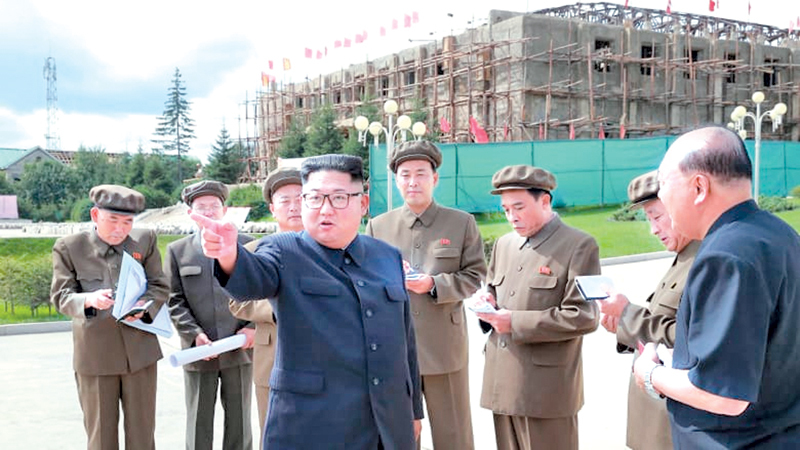 Kim Jong-un visits a construction site during a visit to the city of Samjiyon. NORTH KOREA: Thousands of North Korean “soldier-builders” in olive green uniforms and bright red hardhats are doing everything from digging ditches to putting up walls on multi-storey apartment blocks and government buildings in this northern city near the Chinese border. Samjiyon is one of the main focuses of a massive nationwide construction campaign ahead of North Korea's 70th anniversary in what leader Kim Jong-un has described as a symbolic battle against anyone who would oppose his country. The September 9 anniversary is shaping up to be the biggest event since Kim assumed power in late 2011. Along with huge rallies in Pyongyang on the day itself and the revival of North Korea's trademark mass games at the stadium, Kim has deployed soldiers and ordinary citizens alike to erect buildings, improve roads and work on other infrastructure on a scale unseen in recent years. The construction spree is intended to improve living conditions in keeping with one of Kim's first promises to the nation, that he would bolster the economy so they would no longer need to “tighten their belts”. But it is also a demonstration of the power of his regime in the face of US-backed international sanctions intended to squeeze his economy and force him to abandon his nuclear weapons. Kim made that political message clear during a visit to Samjiyon with his wife last week, when he was quoted by state media as saying “the hostile forces’ persistent sanctions and obstructive moves” have come as a serious setback, but added the North Korean people have risen to the challenge and are “making a history of legendary miracles despite the most difficult conditions”. Kim said that by “showily” building up Samjiyon, the nation is in effect fighting a symbolic battle against those who would try to stifle its “socialist civilisation.” Samjiyon lies at the foot of Mount Paektu, which is closely linked to the Kim family and is considered the spiritual centre of the North Korean revolution. Steam rollers and other heavy equipment are rare, so roadwork is particularly labour-intensive. Work crews spreading out nearly 20 kilometres from the city limits fill potholes with dirt and flatten surfaces with wooden tools. The work has transformed Samjiyon from a relatively sleepy provincial centre surrounded by potato farms into a buzzing hub of activity the likes of which would be hard to find anywhere else. The government says it is to be the model for future development projects nationwide. The Associated Press was allowed to view the city on the same day Kim visited, but was not allowed to shoot photos. One important aspect of the current building boom is that much of the work is being done outside of Pyongyang.